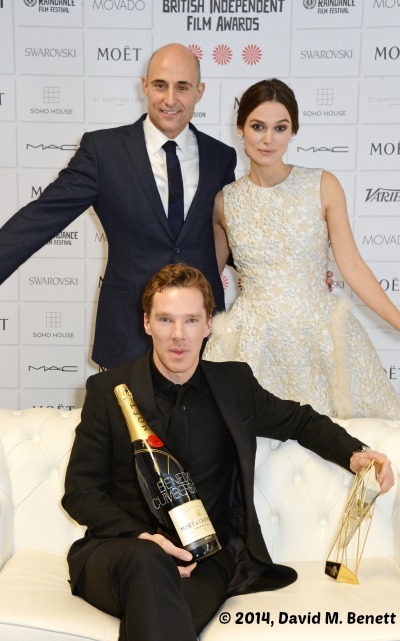 Last Sunday a glittering array of talent turned out for the Moët British Independent Film Awards 2014. Attendees at the 17th edition of the BIFA awards, held at Old Billingsgate (London) and hosted by “The Inbetweeners” star, Simon Bird, saw Matthew Warchus’ 1980s LGBT strikers inspired movie “Pride” as the big winner, with prizes in three categories, including best film, and Best Supporting actors. 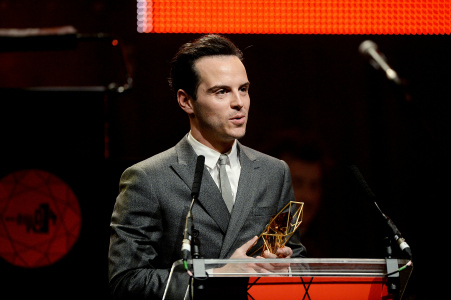 Irish actor Andrew Scott was awarded for his supporting role in Warchus miner’s strike drama, and Imelda Staunton also took home her award for Best Supporting Actress also for her role in that film. Yann Demange won Best Director for “’71”, Gugu Mbatha-Raw won Best Actress for “Belle”, and Brendan Gleeson won Best Actor for “Calvary”. As previously announced, Emma Thompson was awarded the coveted Richard Harris Award for outstanding contribution by an actor to British film, and Benedict Cumberbatch the Variety Award, which recognizes an actor, director, writer or producer who has helped to shine the international spotlight on the UK. The Special Jury Prize went to John Boorman. Other stars, who made their appearance in this year ceremony, include Keira Knightley, Stanley Tucci and Sherlock actor, Andrew Scott.